Ahh April, spring and warmer weather. I’m sure everyone is glad it’s here. April is also Grange month and each Grange should have received a packet from National Grange announcing it. The packet is labeled “opportunity knocks”. Inside is much useful information to help your Grange in planning its celebration. Each Grange should celebrate because we have much to be proud of and it’s time to let the rest of the world know. So bring the packet to your Grange and plan for your activities. If your Grange cannot organize activities for April, use the information in the packet later on this year to plan a membership drive. This is the time of year to start the planning, in fact Granges will begin their evaluation process soon and it is always great to bring in new members. 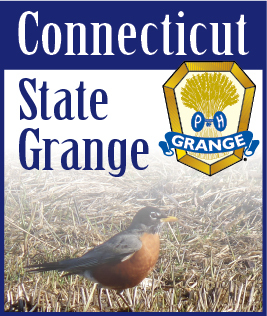 Many Granges took in new members quickly last year because National Grange was coming to Connecticut. If you initiated them through the obligation or welcoming ceremony, now is the time for them to witness the four degrees. I would encourage you to put on at least one degree on your evaluation night. Other Granges will be conferring the degrees, so bring your new members to one of them. You can also help them with the presentation. Remember, you can get points on your Honor Grange report for putting on degrees whatever time of year you do them. Although the Board of Directors are in the process of hiring a full time director for Camp Berger, we do have a director in place for this year. Preparations are under way for opening the camp in July. The camp brochures are out and if your Grange does not have them you can get some on camp clean-up day. The call is going out for able bodied persons to lend a hand to help in cleaning up our camp. It has been a long standing tradition, after the clean-up, to have a dinner and Pink Sash meeting at Winchester Grange hall. The dinner is well priced at $5.00 and the meeting follows the dinner. Even if you do not assist in the clean-up at camp and you do not have a Pink Sash you are still welcome to the dinner and meeting that follows. Come and see what your State Grange is doing. It would help to drop Todd Gelineau a line and let him know if you are attending the dinner.